If you like BBQ, and really, who doesn’t? – then you may be aware of the current craze for Pink/Peach Butcher Paper. 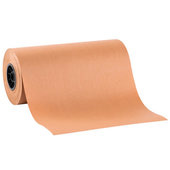 Peach Paper is quickly gaining popularity among many BBQ Aficionados and Culinary Masters to help create and perfect BBQ flavours, techniques and styles across the country. So, what is Peach paper and why has it become so popular in Barbequing circles and why should you consider trying it out? When you break it down, Peach paper is a specially chosen blend of kraft pulp, engineered to be heat and moisture resistant and is FDA approved for direct contact with food products. The special combination of pulp and natural additives allows the paper to have a much higher liquid hold out without the use of things like wax or poly type plastics. The durability of Peach paper comes directly from how it is manufactured, and that process allows it to stay strong-even when wet. Manufacturing is where Peach paper also gets its distinctive peach or pink colour. Contrary to some beliefs that the colour is indicative of a peach essence that is added to help flavor, the peachy shade is simply the finished colour of the paper as it comes out of the manufacturing process. The fibers are not bleached or treated with chemicals which is why, unlike other Kraft papers, it is FDA Approved for use with foods. Why is Peach Paper Important? Peach Paper directly contributes to the flavor, moistness and texture of your finished product. 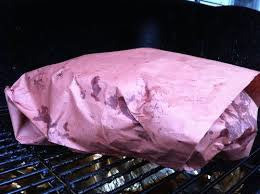 It is porous, so it allows meat to breath which guarantees a perfectly finished bark (or crust) surrounding your tender and flavourful BBQ’d meats, and it does it all without adding to the cleanup, cost or complexity of your BBQ and smoker projects. 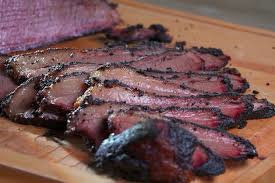 Most Pit Masters use Peach paper near the end of the cooking process to slow down or stop the bark from getting too dark or charred. The porousness of the paper allows some moisture to be retained without ruining the crispiness of the bark. It helps prevent the meat from excessive drying and oxidization and unlike tinfoil, does not leave a tinny flavour on the meat. Peach paper can also be used to prevent drippy messes when your meat is resting, and its wet strength makes it great for lining serving trays and plates and for serving your BBQ with little to no mess to clean up afterwards. 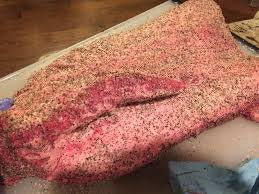 Trim any fat and/or silver skin from the lean side of the brisket. DO NOT trim the fat cap. Cook the brisket fat side down at 250-275F to an internal Temperature of 165F. Wrap in Peach paper and continue cooking until 200-205F internal temperature is reached. Rest in paper for 30 minutes before slicing and serving.